SUBHEAD: SEIU is latest union to declare its support of the Standing Rock Sioux Tribe against DAPL. Image above: Demonstration against Dakota Access Pipeline supported by the National Nurses United union. Still from video below that slams AFL-CIO for supporting it. Support for the Standing Rock Sioux Tribe’s battle against the Dakota Access Pipeline continues to grow with the Service Employees International Union hopping (SEIU) onboard October 1. 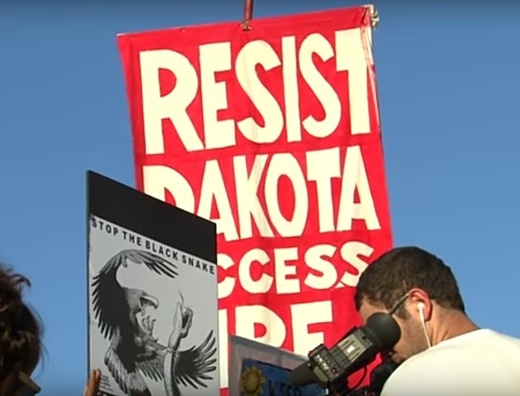 The progressive union is joining at least four others in opposing the Dakota Access Pipeline. “The two million members of SEIU stand beside the Standing River Sioux Tribe in their fight to protect their sacred lands and burial grounds from being dug up if the construction of the Dakota Access Pipeline is allowed to continue as planned,” the union wrote in an online statement. Historical disregard for low income communities and communities of color, including those where many SEIU members live and work, has subjected them to toxic air pollution and contaminated waterways for decades. In these communities, asthma and other respiratory ailments caused by toxic air and poisonous toxins such as lead in the water supply, affect our children’s health and ability to thrive. As the nation’s largest healthcare union, we stand with the growing movement of environmental organizations, businesses, students, parents and others demanding cleaner air and water and to address the growing threat of climate change for the health and safety of our families and communities. SEIU has led #FightFor15 and immigrant-rights movements. It joins the AFL-CIO, the country’s largest union federation, and four of its member unions: Communications Workers of America, the Amalgamated Transit Union, National Nurses United and the American Postal Workers Union. Many other unions have chosen to support the pipeline instead, as Grist reported last month (September 28), highlighting the lingering tension between environmentalists and Big Labor. SUBHEAD: US big labor organizations have an identity crisis, and its name is Dakota Access. 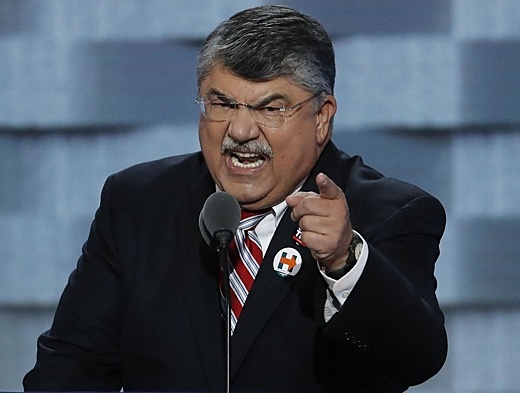 Image above: Hillary Clinton supporter and AFL-CIO head Richard Trumka at the Democratic national Convention is a strong supporter of the Dakota Access Pipe Line for the union jobs it will provide. From (http://www.startribune.com/democratic-national-convention-day-1/388186402/#1). A growing rift has split the country’s biggest union federation, the AFL-CIO. Many labor activists and union members are outraged that Richard Trumka, the federation’s president, threw the AFL-CIO’s support behind the Dakota Access pipeline project earlier this month. The AFL-CIO’s statement backing the pipeline was announced a week after the Obama administration put construction on hold. Trumka acknowledged “places of significance to Native Americans” but argued that the more than “4,500 high-quality, family supporting jobs” attached to the pipeline trumped environmental and other considerations. That move rankled many in the AFL-CIO’s more progressive wing, highlighting strains within the federation of 56 unions representing 12 million workers. Recent tensions within the AFL-CIO have deepened a long-running divide between a more conservative, largely white, jobs-first faction and progressive union members who are friendly to environmental concerns and count more people of color among their ranks. Grist interviewed five staffers at the AFL-CIO and its affiliated unions on the condition of anonymity because they weren’t authorized to speak to the press. Trumka’s public support for the pipeline caught these senior-level and mid-level staffers by surprise, they told Grist — especially because he had recently taken progressive positions on Black Lives Matter, immigration, and criminal justice. A call to Trumka’s office was not returned. The federation’s policy director, Damon Silvers, who is said to have helped write the statement, also did not respond to an interview request. Union opponents of the pipeline project and their advocates quickly responded on social media with satire. One post on Twitter likened Trumka’s position to helping the wrong side in Star Wars. Other frustrated union members and staffers placed calls to Climate Workers, an organization of union workers focused on climate justice, to vent. Brooke Anderson, an organizer at the group, says she fielded dozens of calls from members upset about the AFL-CIO’s position. For those members, Anderson says, working in a federation means more than collecting a wage — it means being part of a broad movement for justice. Anderson says she thought that Trumka’s statement undermined efforts by groups like hers to protect the environment and jobs. Trumka’s statement came out the day after one branch of the federation, the Building and Construction Trades, sent a private letter to Trumka complaining about AFL-CIO unions that opposed the pipeline. In the weeks before Trumka’s public statement, four of the federation’s major unions – the Communications Workers of America (CWA), the Amalgamated Transit Union (ATU), National Nurses United (NNU), and the American Postal Workers Union (APWU) – came out in support of the Standing Rock Sioux Nation’s battle against the pipeline project. All four are part of the so-called Bernie Unions, given their support of former Democratic Presidential candidate Sanders. The AFL-CIO endorsed Hillary Clinton in June, shortly before Sanders had conceded his candidacy, marking another fissure in the federation. AFL-CIO union members who oppose the pipeline are now making their frustration public. A handful of labor activists picketed the AFL-CIO’s office in Washington, D.C., last week. And the Labor Coalition for Community Action, an alliance of groups representing women, people of color, and LGBT union workers within the AFL-CIO, released a statement in solidarity with those opposed to the pipeline. “As organizations dedicated to elevating the struggles of our respective constituencies, we stand together to support our Native American kinfolk – one of the most marginalized and disenfranchised groups in our nation’s history – in their fight to protect their communities from further displacement and exploitation,” it says. Anderson from Climate Workers, who is a rank-and-file member of the CWA, says the dispute over the pipeline represents a historic moment for the AFL-CIO. Rather than issue a statement and ignore the fallout, she says Trumka needs to participate in a crucial conversation with a wide variety of people about how the federation will balance race, labor, and the environment.